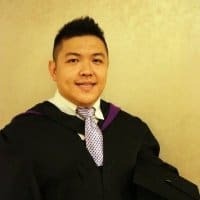 This post was written by one of the stars in our developer community, Kian Ting. 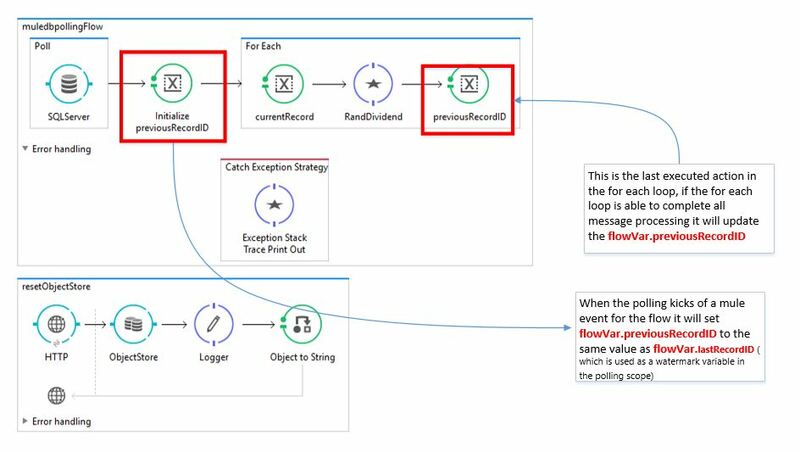 Read this post to learn how to use a Mule app to retrieve legacy data and sync it to a new destination endpoint with the poll scope method. If the Mule application is shut down, it will store the last picked up “record id” in the Java Object Store and the data will continue to exist in the file. This watermark functionality is valuable and enables developers to have increased transparency. Developers do not need to create code to handle caching; it is all configurable! It is always easier to learn something by applying it in practice, so let us make up a hypothetical scenario. In this scenario, the integration developer has to build a Mule app that is capable of syncing newly created employees from a legacy database to a new source system. Let’s say our source system is a SQL Server database. You can do this via any database. MuleSoft already provides an example using an MySQL database, I will be doing the same example differently, so that developers have more sample codes to play around with. You will need to install the SQL Server on your local machine. Then, you need to create a database with the name “MuleDemoDb,” as per the following depiction. 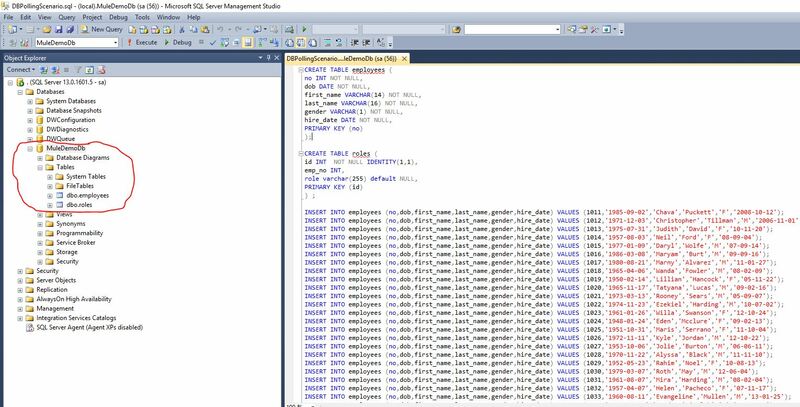 After you create the database, you need to open a query editor and point to the newly created database. Then, execute the following DB Scripts. The figure below depicts how the end solution looks. The main flow that depicts the solution is “muledbpollingflow.” The second flow, “resetObjectStore,” is for us – the developers – to reset the watermark value. This step enables us to not have to keep creating new records. Now, I will discuss the internal configuration of the main flow “muledbpollingflow.” I will start from left to right, so that readers can understand what is going on under the hood. First, in the “receive scope,” we have the poll scope. The image below shows the settings we have employed into the poll scope. I set the frequency for polling to happen every five seconds, by entering 5000 milliseconds to the text box. There will be a zero start delay, and I put in the time measurement as milliseconds. If you look at the figure above, you will see an alternate option to set up a Cron Scheduler. Next up you have the watermark pane. This is where you key in all the configurations for the watermark functionality. The first field would be the flow variable name that you want watermark operation to serialize. The second field is the default value that you want your flow variable to store on its first run. 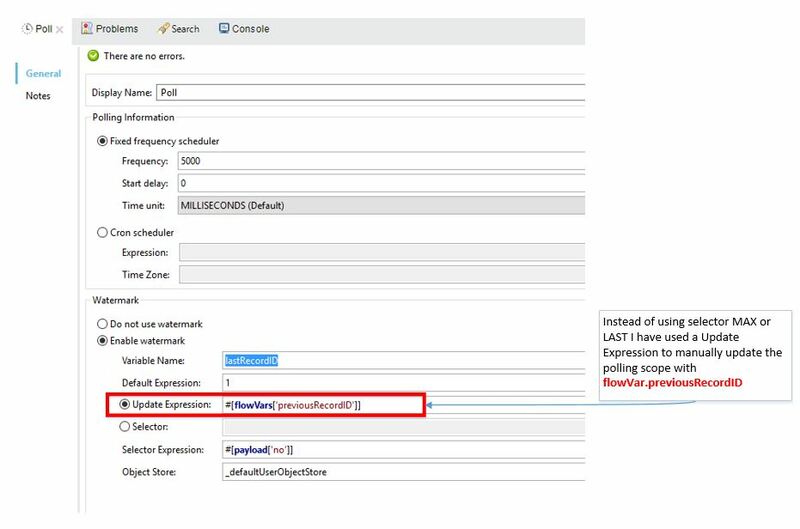 Here I have used the Update Expression instead of the Selector Expression, because that is the only thing that will work for the mentioned requirement in section 2.2 (and besides, the Selector Expression is already demonstrated in the MuleSoft documentation; I chose the Update Expression because its usage is not demonstrated). Next, we have the selector expression. This is important as it tells the watermark function on which field on the database to focus on. Here you can see that it is implied where one record from the database is equivalent to one payload. 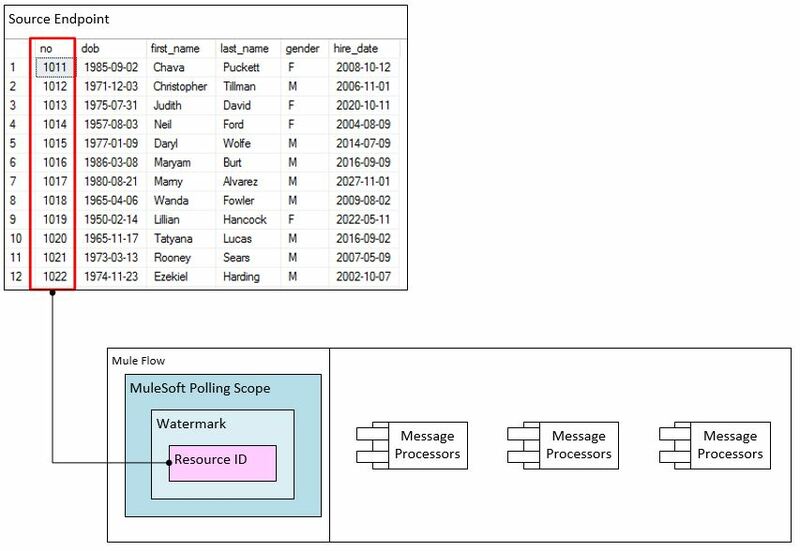 In other words, when a record’s data is retrieved from the database onto a Mule flow, it is then represented as a payload; the field name of the records are the same whether it be from the table (in the database) or from the message payload in Mule (during runtime). Inside the poll scope, we have the database connector. You can obtain the details of the database connector configuration from the source code that I have checked into GIT Hub. Now, we will execute a select operation. In the select operation, you have to key in the SQL statement that will be executed by the poll. Here you can see that I am using the watermark flow variable called “lastRecordID.” Notice that you need to order the records by the section of the query. This is really important because we want an ordered result to be able to apply the watermark function. Now, if you look at the advanced tab (depicted in the iage below) you will see that I configured the database connector to retrieve five records at a time. This enables us to use this flow variable later in the for each scope. Next, we move on to the for each scope, depicted in the image below. We do not need to configure anything in this step. The scope already knows how to split the five records payload. This mean that all we have to do is process one record at a time within the for each scope. This step is necessary because the for each scope splits the records for us. The first operation of the for each scope is to set a flow variable called “currentRecord” with the value of “#[payload[‘no’]]”. 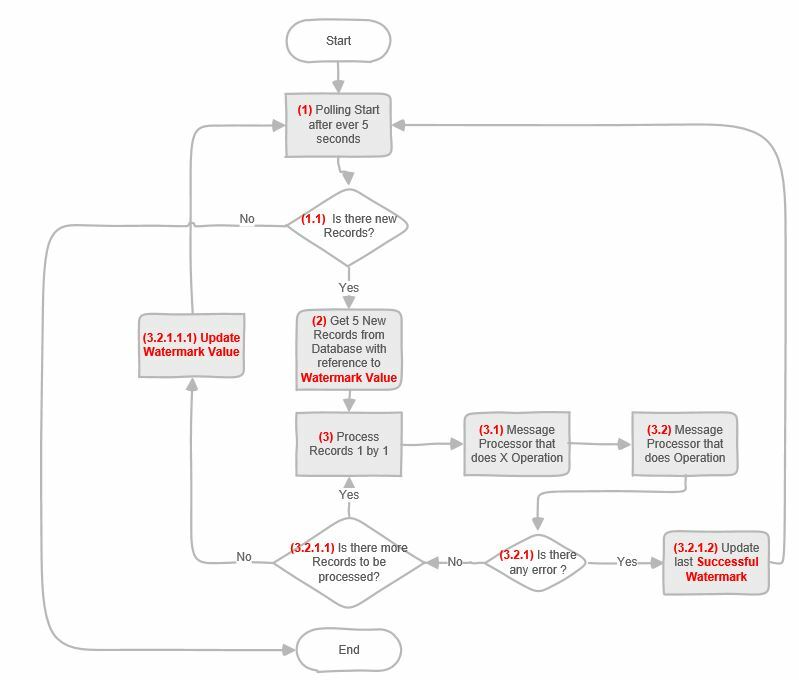 “previousRecordID” is the same flow variable that is used in section 3.1 (above) for the watermark’s update expression. Now, let us look at the Groovy expression between the flow variable setting message processors. What I want to do here is create a division by zero exception/error. The reason I am doing this is to simulate a real-world example where an exception/error can happen anytime, especially when the records are being processed. When an exception happens, we want the watermark function to be able to revert back to the previous successful record and start from there. In other words, the sole purpose of the Groovy message processor is to simulate unexpected and intermittent errors, while we are processing the records in runtime. It’s time to put the rubber on the road and see what really happens during runtime. You could reset the watermark value by using Postman or any web browser. Simply pass in the “Employee ID” as the URL parameter, and the Mule app will pick up the next biggest employee ID from the table (refer to the following image). When you set the watermark value to 1000, the first record in the employee table actually begins with the ID 1011; the poll scope can then start from the first record and work its way through to the last record. When you look at the logs, notice that there are intermittent errors that are caused by “division by zero.” When this happens, the poll scope will resume polling back to the failed record ID. have achieved our objective of creating a Mule app that will fulfill the requirements specified in section 2.2. Finally, with this last step, we have achieved our objective of creating a Mule app that fulfills the requirements specified in section 2.2. The full working source code can be found at this link. There are many ways you can apply to test the watermark functionality. For example, one of the ways my 3-year-old son has helped me test this functionality is, while I was away on a coffee break, he took my laptop and pressed the shutdown button while the polling was in the middle of running. When this happened, I thought I would need to reset the watermark to have it run from scratch all over again. However, I turned on my laptop, started Anypoint Studio, I found that this Mule app opened exactly where it left off. Amazing, isn’t it? This watermark functionality will really come in handy with its implied serialization to disk when we shut down the app or the server. My son has discovered this feature for me! To test this out yourself, download the app or do more testing yourself. The only way to learn something is to experience it and play around with it, so happy exploring! This post first appeared on Dzone. How do you know the configuration properties of the the Database created using the server management studio…before connecting to it using the Mule DB connector?